In August of 2018, I was privileged to join a group from Asheville to visit the Legacy Project Museum and what is popularly called the Lynching Memorial in Alabama. Thanks to University of North Carolina in Asheville and the Blue Ridge District, Western North Carolina Conference of the UMC for sponoring this trip. The Cabinet of the Florida Conference UMC, of which I am a member, wrote a statement of “Faith and Hope in a Time of Racial Injustice. We pledged ourselves then to address the problem of mass incarceration of young black males in our society. (1) This paper looks at a current opportunity to do just that. This blog post is the 2nd in a series of looking at challenges to American Democracy. The first, Hijacking Elections by Dubious Means, may be found here. We started our Alabama adventure with a walk across the Edmund Pettus bridge, from downtown Selma to the eastern foot of the bridge where there are a series of activist artworks on display. 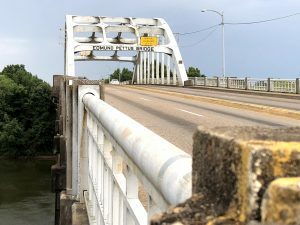 This act was not, as one man from Selma exclaimed, “to make ourselves feel bad so we could feel good.” This act of solidarity was simply a way to enter into the history of which this bridge played a significant role. In March of 1965, it was the march from Selma to Montgomery, 54 miles to the East, that many view as the culminating act of non-violence that led to passage of the Voting Rights act. The first two times this march was started it was met with violence by local authorities and white vigilante groups. The first attempt (March 7th) to begin the march was fought back with tear gas and violence. The second (March 9th) was called off just as it was beginning because organizers did not have a good sense that the marchers would be safe. The week following, President Lyndon Johnson introduced the Voting Rights Act. On the third attempt (March 21st) the marchers began again with the protection of 1,900 National Guard. Five days later, on March 25th, more than 25,000 people marched to the capitol steps in Montgomery. Andrew Young was there among other dignitaries. Young summed up the spirit of the non-violent movement when he told the crowd, “We have come to love the hell out of the state of Alabama.” The Voting Rights Act was finally signed into law in August of that year. So now, fifty three years later, following our trip to Alabama, I thought I would dive into voter suppression in my home state of Florida as another form of denying the right to vote to people of color. 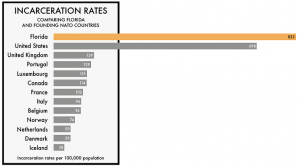 To set the stage I want to lay out the facts about incarceration rates for Florida. When you break down Florida’s incarcerated population, 46% are African American (which make up only 16% of the state’s population). With this as background, we turn to the issue of denying the right to vote to certain individuals. Source: The Sentencing Project: https://www.sentencingproject.org/the-facts/#rankings?dataset-option=FDR . Note that the six highest rates are all in the Southeastern Jurisdiction of the United Methodist Church. There was an attempt to change this when Charlie Crist was then the the Republican governor of Florida. Once you had served your term and any post-imprisonment probation, your rights to vote were restored. But his successor, Republican Rick Scott, upon assuming office, immediately changed it back. 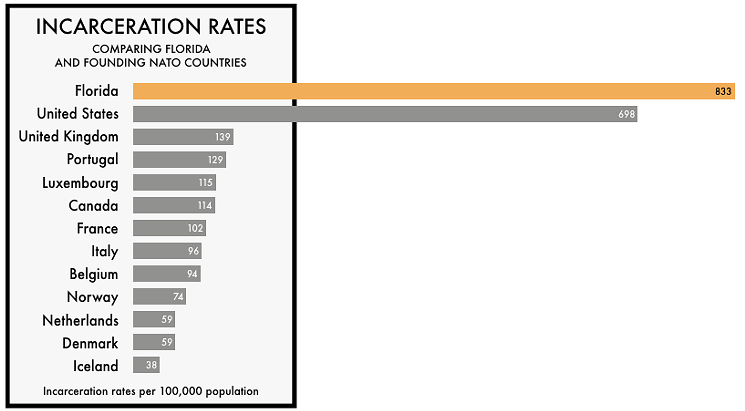 As of 2018, Florida is only one of four states where convicted felons do not regain the right to vote following prison unless restored by a clemency board. Now there is a chance to change all that! Voters in Florida have an oppotunity in this year’s General Election on November 6, 2018. A constitutional amendment on the ballot addresses this issue. Floridans for Fair Democracy gathered more than 799,000 signatures to get this certified and before the people of the state. To be clear, a “yes” vote supports this amendment to automatically restore the right to vote for people with prior felony convictions, except those convicted of murder or a felony sexual offense, upon completion of their sentences, including prison, parole, and probation. To pass and be incorporated into the Florida Constitution, all constitutional amendments require 60% of the vote. There are organizations throughout Florida working on passing this ballot initative, like Second Chances Florida, https://secondchancesfl.org and the Florida Rights Restoration Coalition, https://floridarrc.com. Jesus overturned the tables of the merchants in the Temple because the sacred values of that space had been corrupted (Mark 11:15-19). So too the sacred values of our US democracy have been debased by voter suppression. 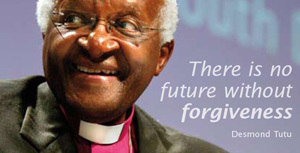 It is time to turn the tables on this corruption and regain the strong value of our democracy.